John Bardgett & Sons Funeral Directors in Westerhope continues to provide the highest standard of funeral care to the local community. We have many years of experience in planning, arranging and conducting funerals, so you can rest assured you will receive exceptional service every step of the way. Our dedicated funeral professionals will offer support whenever you need us. We will work closely with you, making arrangements on your behalf, to help plan the perfect farewell for your loved one. 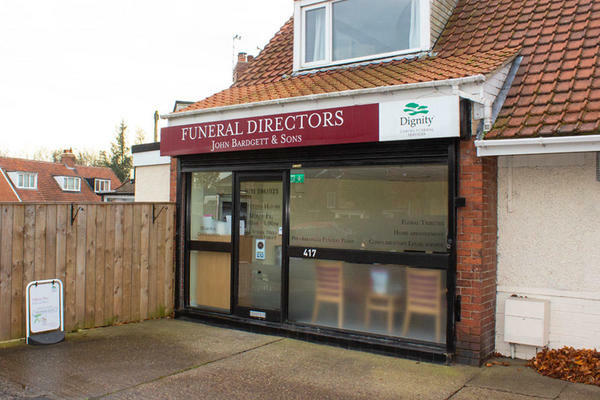 Our funeral home in Westerhope is easily accessible from the surrounding areas of Newcastle upon Tyne, including Blakelaw, Cowgate and Lemington. You can get in touch whenever you need us. We will never be more than a phone call away, 24 hours a day. There is car parking at the front of the funeral home. We are on the main road in Westerhope, near to Barclays Bank. Our staff are available 24 hours a day on 0191 286 1923 if you require our services outside of these hours. Wonderful service from start to finish, friendly, caring staff.